With the kids at home during the summer months, cleaning is the LAST thing I want to do! We go outside and we dredge in dirt, sand and muck when we come in from a good day in the great outdoors. When it comes time for us to (finally) get around to cleaning our floors, we want to do it well but we don’t like spending a whole day cleaning them. The Libman Company asked my family to try some of their cleaning products to see if they can help us clean our home better and more efficiently. The Libman Company has been in the business of helping to clean your home since 1896. It also remains a family-owned business that started making corn brooms and has evolved to produce many other product to keep your home clean. 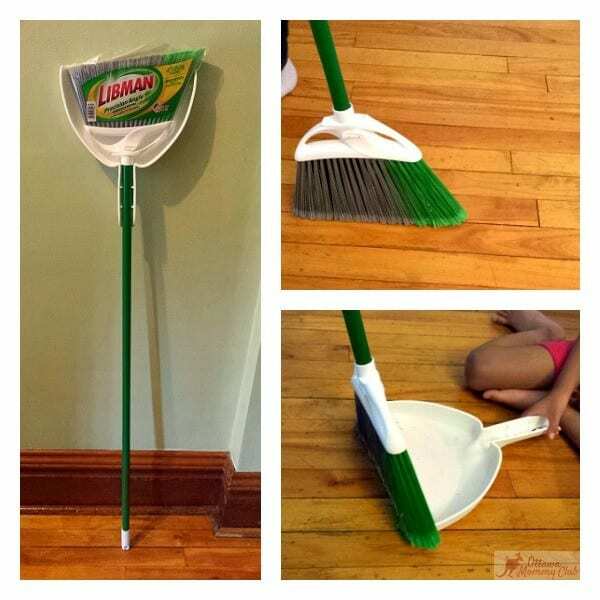 To start getting my floors in order, I swept them with the Libman Precision Angle® Broom with Dustpan. I really enjoyed using this broom as it really helped to get the dirt out of those tough to reach places. It got into the cracks between our floor boards that dirt and other particles of things have found their way into. It also reached into the corners that usually try to capture dust and where dirt goes to hide. The particles also found themselves easily into the deep dustpan that clicks onto the broom handles so you do not have to go searching for it when it comes time to dispose of the muck. There was one aspect of this product I would like to add. I wish that there was some form of teethed or jagged bit on the dustpan to help release the dust bunnies that wanted to stay attached to the broom bristles. This would make cleaning our floors so much more efficient. We then got to the business of mopping our floors. 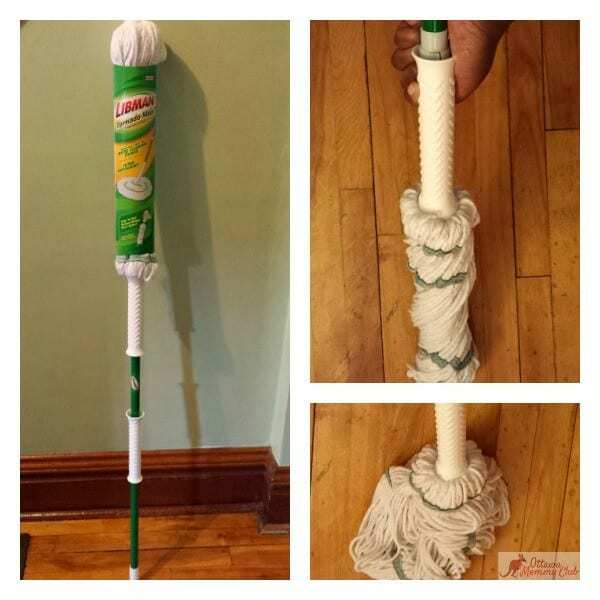 We turned to the Libman Tornado Mop® to see how they have improved on the mop I grew up using. This updated model has all of the ends attached to the bottom of the mop. When these ends are twisted with the help of its click n’ twist ratchet, the mop head is able to wring out a lot of water making it mopping and drying times much quicker. The three bands that keep the strands of the mop together and from tangling so I was able to clean a larger area of my floor. I really loved using the Wonder® Mop. The microfiber GRIPSTRIPS™ got into those tough to clean corners and lifted the dirt off of our floors. The power wringer was really easy to use, and helped to get rid of the excess water the mop head was holding so I didn’t have to spread out extra water from the mop head and the floors dry quicker. I zoomed through the cleaning of my floors, and my floors dried quicker than they usually did. Another feature I really liked about all of these products from Libman were the handles. Whenever I held any of these products in my hands, they felt comfortable and firm so I did not have to grip them as much as I would with my regular mop, and when I did want to have a firmer grip to remove dirt in a hard to reach area, my hands would not slip along the handle. Overall, I loved using all three of these products from Libman to get my floors cleaned quickly and without a lot of fuss. The wringing action on the mops worked so well to remove excess water from the mop heads so floors would not be overly wet, and the broom got into those places my broom would skirt around. 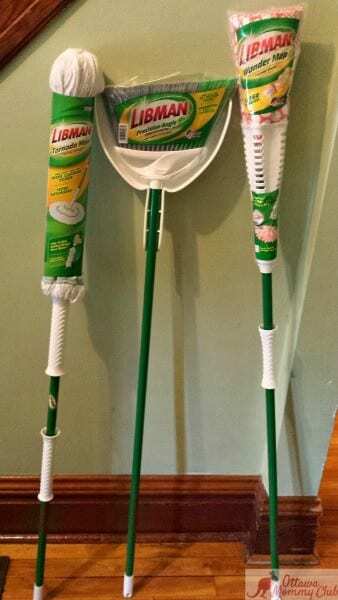 These Libman products are now some of my favourites to use, and cleaning will not be such a daunting task to take on this summer! You can purchase products from the Libman Company at any Home Depot in Canada. For more details about any of these products or The Libman Company, you can connect with them on their website or on their Facebook or Twitter pages! 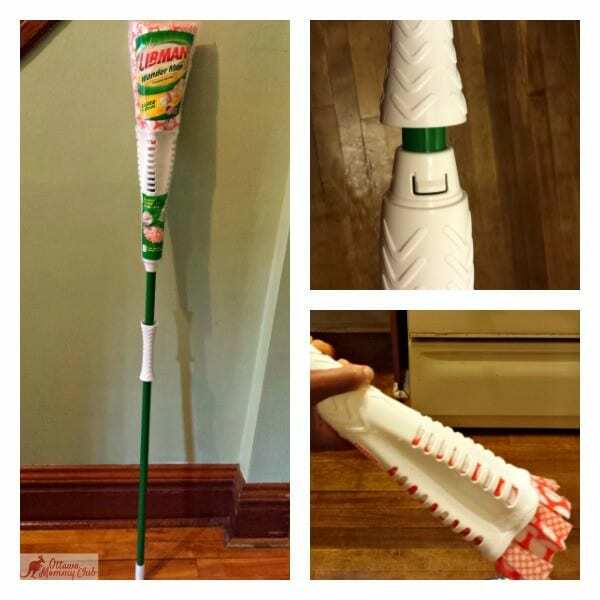 Disclaimer: I received products from The Libman Company in order to write this review. The opinions expressed are my own. This giveaway is open to Canadian residents and ends at 11:59 EDT on August 16th, 2015. Would love to try them all out but mostly the Wonder Mop. I would like to try their Toilet Brush & Plunger Combo for the bathroom! They all sound great but I would like to try the Wonder Mop. I would love to try the Wonder Mop. Great products! I would really love to clean my house with the Freedom Spray Mop. With four children, dog and husband to clean up after, I think it would be perfect! I would love to try the Wonder Mop. I would love to try the Wonder Mop! Thanks for the chance! I would love the hardwood floor cleaning system. I’d like to try their Hardwood Floor Cleaning System. I’d like to try the tornado mop! Thanks! I would like to have the Jumbo Cotton Wet Mop and the clean & rinse bucket with wringer. I definitely would love to try the Wonder Mop. I would love to try their hard wood floor cleaning system. I’m most interested in trying the Tornado Mop. I think the Tornado Mop would be great in our kitchen. Half of our apartment is carpet and half our apartment is hard flooring. I would like to clean my house with the Freedom® Spray Mop. I really like the Tornado Mop®…. though I would get the pail with it. I would like to try the Extra Large Microfiber Floor Mop Product #00926. I think it would work good on my wood floors. Would love to get the Freedom Spray Mop ! I would like to try the Clean & Rinse Bucket. I would love to give the Wonder Mop a try. I would use the everyday microfiber cloth pack frequently. I would like to try the Wonder Mop! I would love to try the wonder mop with having dogs around it would really come in handy. I’d like to try the Freedom Spray Mop. The Freedom Spray Mop is something I’d like to try. I would like to try the everyday wood floor cleaner – thank you. I really think the Wonder Mop is neat! I would like the Wonder Mop. Easy to wring out. I’d love to try the Wonder® Mop, I like the fact that it has a power wringer which is easy to use. I’d love to try their Tornado mop. I would love to try the Wonder mop or the Tornado mop. I clean up after two little ones!!! The Wonder mop seems like a great tool! id like to try the tornado mop out. my mop is old and yucky now. The Wonder Mop looks handy! The Tornado mop looks good. I would love to try the everyday wood cleaner but hat Tornado mop sounds awesome too! I would love to try the tornado mop. I’d like to clean my house with the Wonder Mop. I would like to try the wonder mop, to replace my old vileda mop. I’d go for the jumbo cotton wet mop for my floors. Tornado Mop! With the grandkids always playing on the floor, the cats & furry flying everywhere. All of these sound perfect for a easier time cleaning the floors! I love the wonder mop,looks like it will do a great job. I like the Wet & Dry Microfiber Mop. Looks like a nice wide mop. I would like to try out the Scrubster Mop. I would like to try the Tornado Mop. While at first I thought it would be the Wonder Mop, after further reading it would actually be the Tornado Mop. « ‘All Fall Down’ and more HOT summer reads!